no 6. as a gift would officially make you the coolest wife ever! That was my favorite as well. Love everything!! Can't wait to see Hucks! Maybe you could sneak in a pretend baby girl wish list (aka help a sister out you creative genius you!)? love all of your selections...I always have such a hard time finding gifts for my husband. Those sunglasses are perfect! But maybe I would end up wearing them most of the time? ha! I'm in love with Fab... so much so that they send me presents frequently. And my husband has cut me off. Love all of these! I own #6 and absolutely adore it! Great purchase. i would cuddle you so hard!! yes! Number nine is just wonderful. And I want it. This is cute! 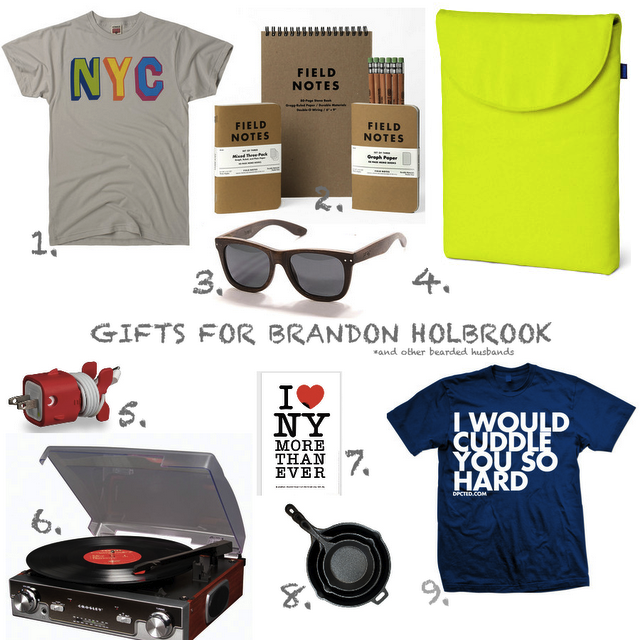 I'm going to buy a gift or two for my hubs from this list and maybe make a set for him on my blog! Love you Natalie! I know this will sound weird, but I've recently discovered the blogging world as I now have a sit down job that involves a lot of time spent on hold, but I really appreciate how budget friendly your choices are. I normally get so upset because all the prices are horrendously out of my range, so kudos to you! I love fab! We are addicted! They even have gifts for our pup!! Love the cuddle tee, my husband would love that!! Yay cuddles. I love all the things you picked out for your husband but I've already gotten my husband tons of things. I can't help spoiling him! That 'I would cuddle you' tshirt is amazing...my little boy says that to me....'I want to cuddle you so hard you say NO MORE CUDDLING'. I think we have to buy it!